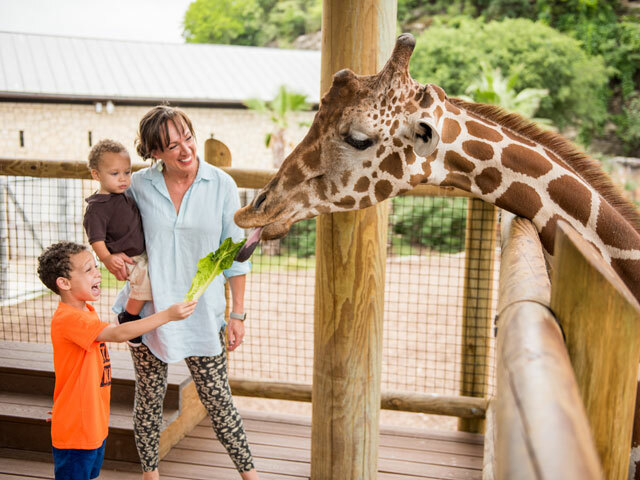 Feed a giraffe by hand, watch hippos, and Nile crocodiles swim, and enjoy a variety of animals from around the world at San Antonio Zoo. Exploring one of the oldest, most unique attractions in San Antonio takes you on a journey around the globe, where you’ll encounter species great and small from the rainforests of South America and the deserts of Africa to the jungles of Asia. Located a few minutes from downtown San Antonio and the River Walk, a visit to San Antonio Zoo is a fun and exciting for travelers of all ages and it’s open year round. A flock of Caribbean flamingoes bedecked in bright pink feathers greet you at the entry of the zoo, and it only gets better from there. Marvel at the grace of the red ruffed and black-and-white ruffed lemurs as they jump and play, then say “howdy” to the zoo’s three species of bears (black, speckled, and sun). Your journey then takes you to the Cat Grotto, home to small felines as a caracal and a clouded leopard, followed by a trip to the plains of Africa, where the white rhino, storks and hoofstock roam. Throughout your stroll in the zoo, you’ll see more than 750 species, including everything from lions and tigers to turtles and tropical birds. Yet, seeing these creatures is only one of many experiences you’ll have at San Antonio Zoo. Get up close with a giraffes as you feed them their favorite lettuce, or go on a Behind the Scenes tour to interact with one of the zoo’s largest and rarest animals (such as an okapi and a white rhino). Hang out with playful lorikeets in Lory Landing and step into the lush habitat of the Butterflies! Caterpillar Flight School that is home to 15 to 30 species of butterfly you can interact with directly. When you’re done exploring the zoo, make sure to ride the Zoo Train for a fantastic tour of Brackenridge Park on a 1/5-scale model of a diesel-type passenger train. Along with all of its exhibits and experiences, San Antonio Zoo hosts its fair share of can’t-miss events throughout the year. From late May to early September, check out the larger-than-life insect replicas spread throughout the zoo during Bug Mania!. Later in September, the zoo celebrates “Croctoberfest” with food and beer, and your little ones are invited to don their spookiest Halloween costumes for Zoo Boo! every Saturday and Sunday in October. Finally, visit throughout the holiday season for Zoo Lights, when the zoo is transformed into a winter wonderland with twinkling lights and the smell of roasted s’mores and hot cocoa fill the air. With thousands of beautiful animals to see and a stunning range of experiences to have, a visit to San Antonio Zoo is a must during your stay in the Alamo City.